I assisted at a local community race on November 3. 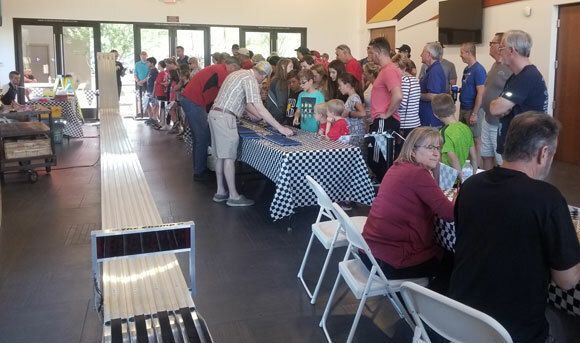 Called, the WestWing Classic, the event includes a car show and for the first time a pinewood derby race. Categories were Under 18, Over 18, and Outlaw. The race was sponsored by Copper Hills Church. David Keith (Derby Dave) ran the race itself, while I managed the inspection process. Of course, I had to enter a car myself (way Over 18 category). Just to keep me humble, I made the rookie mistake of setting the weight of my car with a scale set to weigh in Troy Ounces. (1) So, at the inspection, I was several tenths overweight. Using my pocket knife, I managed to dig out enough tungsten cubes to make weight, with only a little bloodshed in the process. But overall, the event went well, and folks seemed to have a good time. Yours truly won the Over 18 category. (1) The Troy ounce is used for weighing precious metals and gem stones. 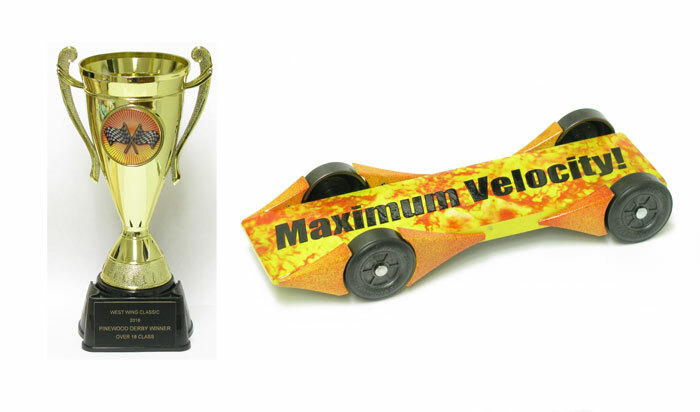 Pinewood derby cars are weighed in common ounces (official name is Avoirdupois ounces). Every year I receive a few e-mails that contain the above complaint. Obviously, these are not my favorite e-mails and I always feel my stress level rising as I read the e-mail. But in 75 percent of these e-mails, the writer goes on to say that their car won a speed trophy, it just wasn’t the trophy for First Place (clearly, a lot of people are seriously competitive). These people are just trying to improve their performance for the next race. For these cases I ask a few questions as to the lube, the alignment method, rules, etc. ; and try to help them come up with a few ideas to try for the next race. Folks are generally very pleased that I have taken the time to try to help them. However, for the smaller percentage of people whose cars didn’t get into the winner’s circle, I am very careful in responding, as I don’t want them to think I am critical of their car building skills. So, I try to ascertain what they did or did not do, what rules they were using, and the level of skill of the other participants; and then try to make some suggestions. Obviously, there are many reasons why a car does not do well, but over the years I have found a few reasons that keep cropping up. Today, I’ll share those with you. 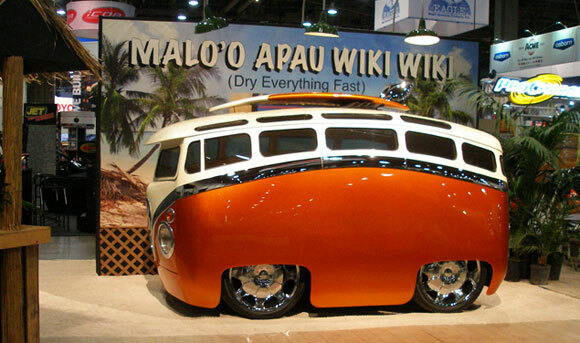 I know that our readers tend to be more sophisticated car builders, so this information may not be pertinent to you. But you should find it helpful when you are helping novice car builders. Sorry, there really isn’t a silver bullet. Regardless of the hype on some web sites and YouTube videos, there is no one product/technique that will guarantee a trophy. 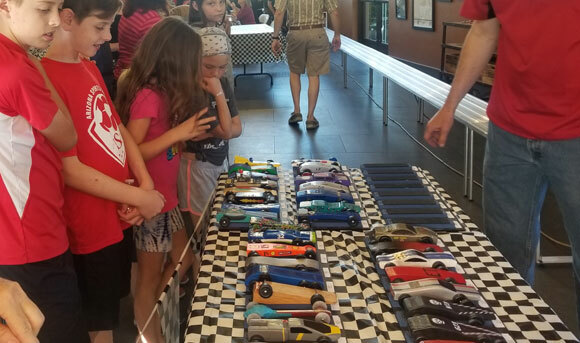 There are many factors at play in pinewood derby racing, and neither a secret lube, a special weight, a body design, a unique tool, bent axles, or a certain alignment method will guarantee a victory. Instead, each aspect of building needs to be considered and carefully implemented. For an overview of these aspects, take a look at Volume 18, Issue 1: Five Keys to Performance. Not only is there no silver bullet, there are also some duds out there that can hurt performance. The three that come to mind are powdered Teflon (white powder), tungsten disulfide, and moly disulfide lubes. There may be a way to use these successfully, but I have never found a way, and in all legitimate tests that I have seen they are inferior to a high-quality graphite (such as Max-V-Lube) or Krytox 100. One of the most common questions I am asked is: “What is the fastest car body you sell?” I try to explain to the person that the car body is only one factor. But they generally come back with: “Okay, but what is the fastest body you sell?” I then give a few suggestions. This is a very common misconception: that a sleek, low-profile car body will give you a victory. Certainly, it is an important factor; but without good wheels, axles, lube, and alignment, it will be just another “also-ran” car. It is always best to lube thoroughly before installing the wheels and axles, as it is difficult to get a good lube job once the wheels are installed. But even so, you must apply graphite multiple times, spinning it in thoroughly after each application. Some folks really go the distance in applying graphite, but then wear it out before the race, running the car on a treadmill or running many test runs. Graphite properly applied will generally give good performance for 15 heats or more; but recognize that a heat is about three seconds. So, if you put a car on a treadmill for one minute, you have simulated twenty heats, and have used up the lube. In summary, make sure to lube thoroughly but test judiciously. Another common response is that the graphite was (wet or dry) packed. Usually, this occurs after watching a YouTube video. Now there may be ways to pack graphite and have a trophy winning car, but unless you know first-hand how it is done, I would avoid graphite packing. There may be a few ways to do it right, but there are lots of ways to do it wrong. So, user beware. A final area where mistakes are commonly made is in alignment. Ranging from no alignment consideration to improper rail-riding setup, misalignment really slows down a car. Here a are a few of the common mistakes. Always press an axle into each axle slot location or each axle hole before cutting the block. 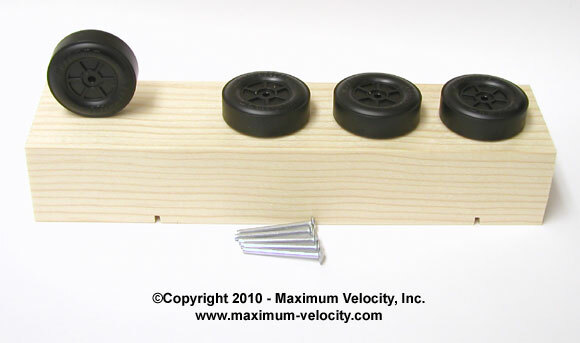 This establishes the pathway for the axles and ensures that the wood will not split during later installation. Use a Pro-Axle Guide or Pro-Body Tool to make sure that the axles are installed straight – crooked axles will lead to poor results. Finally, make sure that no paint gets into the axle slots or holes. Use a Paint Stand or insert round toothpicks into each position while painting. I am dumbfounded by the number of people that try to free-hand bend axles. Many people believe that having bent axles is a silver bullet; but lacking a tool for bending they just bend them with pliers. What a disaster; please do not do this. If you do not have a Pro-Rail Rider or Pro-Axle Bender, or have not purchased Rail-Rider Axles, just leave your axles straight. You will have a faster car with straight axles then one with randomly bent axles. Another issue with axles is using properly bent axles but failing to align the rear wheels. If the rear wheels are misaligned, they will fight each other, increasing the amount of friction as the car rolls down the track. You are better offer with unbent rear axles, than with improperly aligned bent rear axles. Part of the failure to align the rear wheels may be due to the instructions for using the Pro-Rail Rider or Pro-Axle Bender. (1) The instructions say to mark the 12 o’clock position of the axle with a marker. Then install the axles with the mark upwards. This is correct, but there is still fine tuning needed. By just placing the mark upwards you may be anywhere from 11:30 to 12:30! So, rear wheel alignment is necessary. For information on how to align the rear wheels, please see Volume 16, Issue 10: Rail-Rider Alignment Walk-through. If you look at various web sources for the amount of Rail-Rider drift, you will get a plethora of answers. I have seen numbers ranging from 1 inch over 8 feet to three inches over 4 feet. What is the correct number? Well, it will vary depending on the aggressiveness of the COG, and on the track setup. Since you cannot control the track setup, you want to have more than enough drift to compensate for tracks that are not level. The track may lean right while your car is set to drift left. The track lean will cancel out the drift causing the dominant wheel to leave the rail. The front dominant wheel must remain firmly against the rail to keep the car stable and tracking straight. Since there is very little weight on the front end of the car any little bump or track deviation can move the dominant wheel off the rail. Once the front dominant wheel loses contact with the rail, the car will likely become unstable, displaying the “death rattle”, a rapid side-to-side movement which greatly decreases speed. I hope that this article has provided you with some tools to improve the performance of your car, and hopefully you can also help novices improve their performance. If you have any questions or comments, please feel free to send them to me. (1) These instructions explain how to use the tool. They do not explain how to implement rail-riding. (2) People often ask, “Doesn’t the large amount of drift increase the friction between the dominant wheel and the guide rail?” The answer is, “Not really.” The front dominant wheel is angled downwards. So, the inner edge of the wheel is off the track and rolls on the rail. So, the frictional force is rolling friction, not sliding friction. Have you been holding off getting a Pro-Axle Bender, stocking up on tungsten weight, or purchasing a car kit? Maybe that “pinehead” in your family is really wanting some Outlaw Wheels, a COG Stand, or something else? Now is your chance to get those items at a discount. Through December 11, 2018, you can get 10% off any order. To take advantage of this limited time offer, use coupon code NOV28NL during checkout. The Chevy Sedan has working headlights and taillights. We used “grain of wheat” bulbs wired to a single AA battery in the hollowed-out center of the car. The hubcaps are re-purposed and modified wheels from a plastic model (we cut off the rims and glued them onto the required axles). To create the top and fenders we took the wood from a second Awana Grand Prix kit; cut it into 3 length-wise pieces. We glued a piece to each side and cut the third in two and glued them on top. 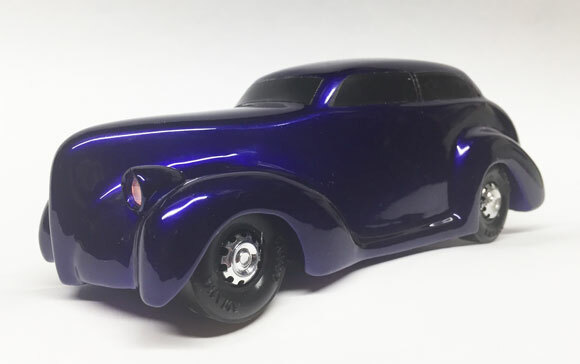 A Dremel was used to whittle out the shape of the car. A 1 inch hole saw was used to make the rough wheel openings. When the car was shaped and ready for paint, we took the car to a local body shop and had them prime and paint it. 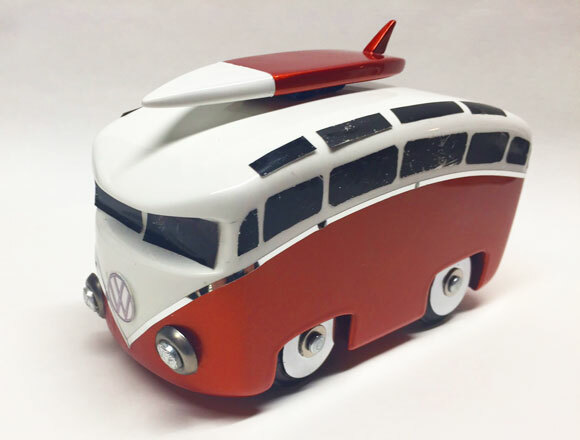 A clear coat was used to finish the car. Although it crossed the finish line, it was built to win a design trophy. It did! 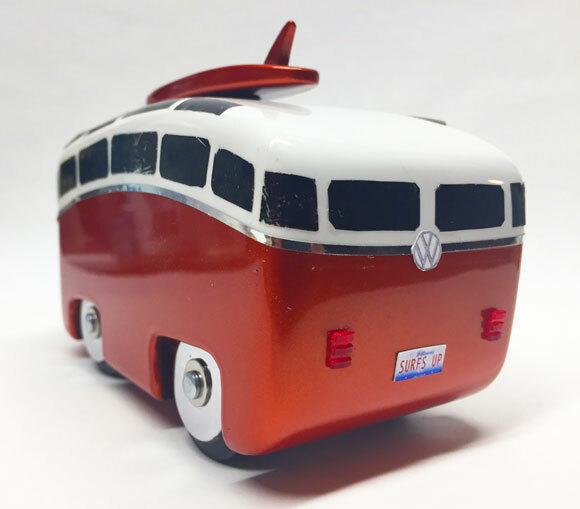 Ron Berry built his cartoon van “Surf Seeker” by hand. It’s real and it drives just fine. 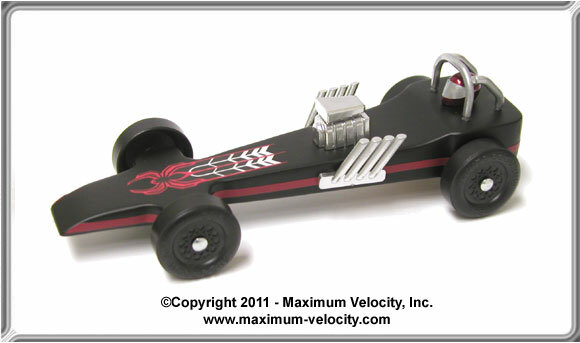 My scale version was built using two Awana Grand Prix pinewood derby kits. The wheelbase was shortened considerably (call me Captain Obvious). I used a Dremel to whittle out the lines of the van. A hole saw was used to do the wheel wells. Then, I sanded/thinned out 4 fender skirts and glued them at the top of the fender wells to partially cover the wheels/tires. 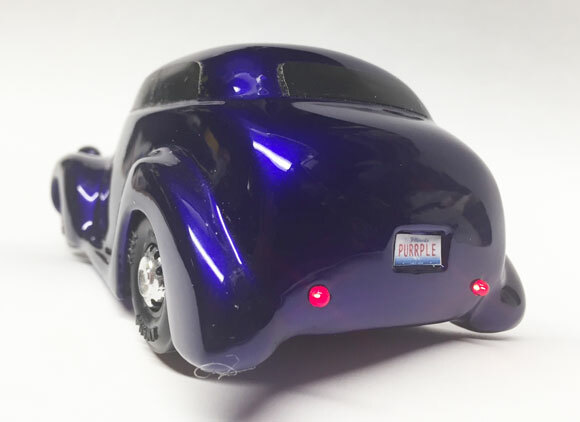 The taillights are from a Mustang model kit. The headlights are plastic lenses from the Mustang model kit centered on small finishing washers. Simple black plastic bags surrendered to create the windows all around. Silver 1/16-inch pinstripe tape was used for the center stripe. A wood ruler was sacrificed to cutout and whittle the surfboard. I used a belt sander to give the surfboard it’s curve. Surf Seeker ran poorly. It did not reach the finish line. That’s OK with me. I only care about design awards. Editor’s Note: This has nothing to do with the pinewood derby, but since you likely have a boy or two I thought you would enjoy. For those with no children – this is totally hysterical! For those who already have children past this age, this is hilarious. For those who have children this age, this is not funny. For those who have children nearing this age, this is a warning. For those who have not yet had children, this is birth control. If you hook a dog leash over a ceiling fan, the motor is not strong enough to rotate a 42-pound boy wearing Batman underwear and a Superman cape. It is strong enough, however if tied to a paint can, to spread paint on all four walls of a 20×20 ft. room. Certain Legos will pass through the digestive tract of a 4-year old boy. VCR’s do not eject “PB&J” sandwiches even though TV commercials show they do. 85% of Women will pass this on to almost all of their friends, with or without kids. We have a big race that is still a month off. If we apply the graphite now and attach the wheels, will the graphite lose effectiveness because of the lag in time? Or once on does it kind of stay put? Either way we will reapply immediately before the race, but I would prefer to get the car together now, so we can get it tuned up. Really want to perform well! Graphite has an indefinite life. So, if you lube early, then keep the car in a dust free area (in a box), it will be fine. Also, if you lube thoroughly, I would avoid the temptation of lubing before the race. There is no advantage to lubing at the last minute. But you will just get more graphite on the paint job; and since you have to spin the wheels thoroughly to make sure it is worked in, there is a risk of damaging the car. What are your thoughts on reapplying graphite during the derby? We are given the opportunity to reapply after 6 runs if we advance to the finals. In our Pack we did reapply after 6 runs but I’m not sure if it helped or hurt (no timers). We have the district race coming up and would like to know if you think we should reapply after 6 runs? We had to run a total of 12 races in our den. If you thoroughly lubricate the car before the race, then I would not relube after six heats. A well-lubed car will run at top speed for many more than twelve heats. If you relube, you risk damaging the car or not getting the graphite broken in well. So, it could run slower for a few heats. I have a question about paint. In the instructions for the kit we ordered, it said to avoid enamel paint if spray painting. Is this because of the longer dry time or possible wrinkling or is there another reason? We normally use Testors One Coat Lacquer but were wondering about enamel. Also, should the primer and paint be the same type? Thanks for your help. Yes, enamel has a long cure time, odd recoat times, and is prone to wrinkling. Lacquer generally works better and is much more forgiving. I have not found issues with lacquer and compatibility with primers. But you do want to use the same brand of clear coat as the color. Regardless of what paint you use, make sure to follow the instructions on the paint to the letter.